Is getting pregnant faster on the top of your list? What a beautiful and life-giving thing to spend your precious time and effort on! If you’re reading this then, first off, congratulations on being willing to explore making some changes. That’s a big deal. Whether or not getting pregnant is actually a goal, a lot of people never get to the level of willingness to read something that may help their health and body. Below is my top 5 list of natural tips to boosting your fertility that I have found to be both effective and easy to implement. I could probably create a list of 1000 tips, but my point is to make this simple and to reduce the time you spend searching online for things that have actually helped women get pregnant. When I see my patients for acupuncture, assessing their sense of urgency around conception can be challenging. Sometimes clients want to work their way slowly into changes. Others want to “do it all” and are ready to take on massive changes immediately. What’s more, their level of desire to get pregnant can vary dramatically from month to month based on things like where they are with work, their personal relationships and general stress levels. Whether you want to try on or two of these tips or go all out, my job as provider and a healer is to meet you where you are and work from there. That’s why these actions are neither super basic nor totally sophisticated and you can try one or two things or do them all. When I was a new provider, I may have tried too hard to impose my own will and ideas on patients who just weren’t “there” yet. With hindsight, I can see I risked overwhelming them or wearing them out. So here’s the thing: I totally get it if you read this and don’t feel there is anything you want to change. If that’s the case, then you are probably right. You know your body and what you need. This isn’t about judgement or a my-way-or-the-highway kind of program. This is about being supportive as you find your own way to fertility, whether through natural medicine, Western medicine or some combination of the two. In fact, in the 15 years I have worked in fertility—and in light of the changes Western medicine has embraced in that time—some of the best cases I have seen have been when women were surrounded by a team of holistic, primary and/or specialist providers who supported their choices and encourage all avenues of healing. With that said, below are my top 5 tips for boosting your fertility naturally. According to Chinese medicine, if you want to get pregnant faster, you will want to keep your blood flowing by keeping everything warm—starting from the ground up. We believe that the chill from walking on cold floors and damp, cool grass gets sucked in through the feet and brings cold into the womb which, in turn, reduces blood flow in the uterus (which is most vulnerable to cold during the menses, by the way). So take extra care to get nice wool socks, especially if you live in the north—and no flip-flops in the fall! Just as you want to keep the cold out of your womb from the outside, the same goes for what you put inside your body. That’s why you will want to drink warm fluids and eat warm (or at least room temperature) foods. Drinking warm or hot water encourages blood flow and movement to the womb. It also supports healthy digestion and increase the absorption of the food you eat. I’m a little outside of the box compared to most acupuncturists as I am still a fan of raw foods (more on that below). So if you eat raw foods, just make sure your meals are warmed up to room temperature before consuming them (for example, let a salad sit for 30-60 minutes). Most of us know that eating a variety of fresh, colored fruits and veggies that are in season is only going to support your body and fertility. If you are ingesting low-quality foods, there’s a good chance you’re not getting enough from our diet. Our bodies are full of thousands of enzymes. Enzymes help modulate the immune response. They reduce inflammation and break down fibrin, which can impede blood flow and be present, for example, in scar tissue. Myself, I feel that starting the day with a raw smoothie that is balanced in nutrition is an excellent way to nourish our eggs and uterus. I look at enzymes like a toothbrush for the insides of our uterus and fallopian tubes: They clean things up and dissolve unwelcome adhesions, sweeping away the dampness and other uninvited guests in our reproductive system for a seamless implantation of our embryo. Like I said, some acupuncturists will cringe at the thought of consuming raw veggies (especially first thing in the morning) but I have seen amazing results for the women I treat in my practice. I do feel, however, that more cooked foods are appropriate during the winter months to complement the energy of the season. At other times of the year when food is fresh off the vine (or stem, or root) I say go for that! If you’re looking to incorporate just one food with fertility-friendly enzymes, I’d say it is pineapple around implantation. However, you can do this wrong so stick with me on how you eat this. You want to do two slices of FRESH pineapple INCLUDING the core, as many of the enzymes are nestled in the core. It has to be fresh because the enzymes in pre-cut pineapple oxidize when exposed to the air. Other quick ways to get a rush on enzymes quick is freshly pressed organic juices. There’s a lot more to say about diet and fertility. In addition to my previous post on fertility-friendly diets, I’ve included a whole section about in my e-course on natural fertility. Acupuncture is a lovely, gentle and cost-effective way to support your body back into a fertile state with or without assistance from Western medicine. Nothing else can guide your body into a healing mode where years of stress and hormone imbalance can start to correct themselves quite the same way. In fact, these days Western medicine is coming to the same conclusion that acupuncturists have for centuries! There are certainly more ideal times than others to come in for treatment, but good acupuncturists will work with your provider to map out the treatment plan that is appropriate for you. 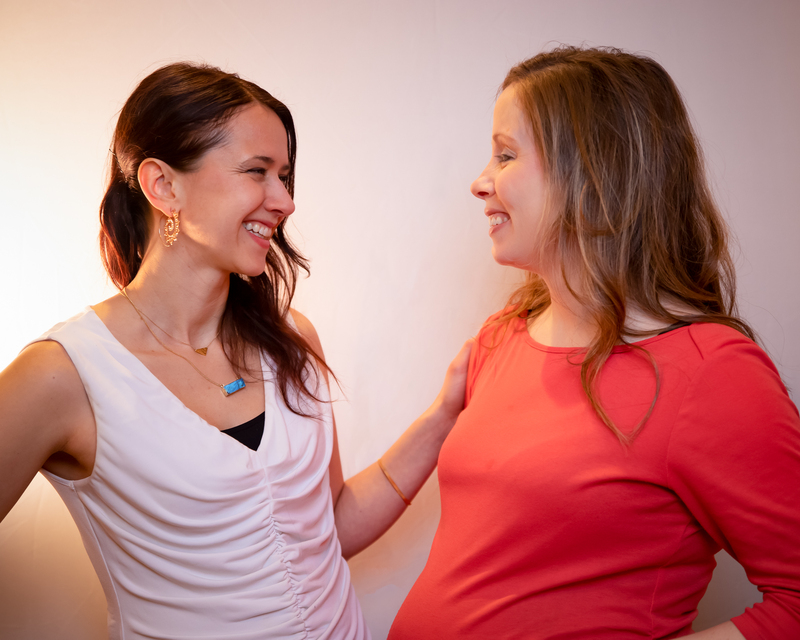 The reason acupuncture helps you to get and stay pregnant is because, as acupuncturists, we look into the root of all of you and not just the symptoms around falling pregnant. This is especially important in cases of so-called “unexplained fertility.” I have not seen one case of “unexplained fertility” where there wasn’t a corresponding pattern of imbalance that we couldn’t address with Eastern medicine. Relaxing and nourishing acupuncture treatments are a great way of moving yourself in the direction of conception. But if you’re not ready to take the plunge you also can do at-home acupressure to encourage your own fertility. I teach an at-home acupuncture course where you can perform effective acupressure points on yourself that have been used by acupuncturists for thousands of years to help women conceive. The Arvigo Techniques of Maya Abdominal Therapy, or ATMAT, was my first love. I know it’s a mouthful but— wow!—does this treatment do wonders. ATMAT is a non-invasive manual therapy intended to un-tip the uterus so that proper blood, lymph, nerve and hormone communication can occur. The acupuncturist in me loves this treatment because it physically gets the qi of the uterus moving and healing. Before I became an acupuncturist, I was a practitioner of the ATMAT. I saw years of cramps, clots and menstrual imbalances completely shift for women in three months or less. I myself had painful and somewhat debilitating menstrual pain that the ATMAT resolved for me within a few cycles. One of the best parts of this therapy is the fact that the provider will teach you to do a portion on yourself so you can do your own self-care uterine treatment at home. While it feels great to surrender and let someone else take care of yourself at times, anytime you are empowered with tools for your own self-care you have one more technique to use wherever you go. While I can’t say what’s best for you, I do encourage you to ask yourself what you have to lose by trying it. Start with this list of Arvigo Techniques of Maya Abdominal Therapy providers who are committed to staying up-to-date with the latest knowledge to equip and help you. Hopefully you will find one near you. We also offer ATMAT at Isthmus Wellness here in Madison, WI. Above all, remember that all you can do on your path to becoming a mother is your best and your best will vary from month, to week and sometimes even hour! Don’t feel guilty that you are not doing “enough.” When you feel ready, consider adopting one or more of the above tips, check out my e-courses on natural fertility and/or send us an email to receive My Natural Fertility newsletters that are filled with tips, free gifts and exclusive discounts. No Replies to "5 Natural Tips to Getting Pregnant Faster"